Place cream cheese and sour cream into a 1.5 quart temp-tations® baker or pie dish. Use a hand mixer to blend until smooth. Use a spatula to spread across the bottom of the baker. Drizzle wing sauce and ranch dressing over the top. Sprinkle with cheese. Bake for 25 - 30 minutes or until cheese is melted. 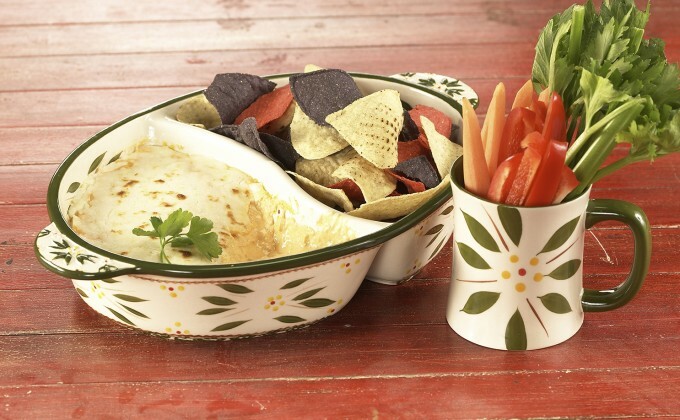 Serve hot in temp-tations® convertible cake stand with crackers and veggies.